It seems ages ago when we first experienced the sculpt of Archangel. Luckily Hasbro was kind enough to give us an X-Force version at SDCC with wonderfully metallic wings. Unfortunately, the retail version sports gray plastic wings with no metallic sheen, but that does not detract from the sheer joy I feel in owning this figure. In classic Marvel Legends style, Wave 1 of 2013 is named the "Hit Monkey Series." Which is appropriate as the BAF (Build a figure) is Hit Monkey and quite a lot more fun than saying wave 1 2013. Let's get started on One Per Case's first figure from the Hit Monkey Series: Archangel! Yah, I like the sound of that! And it should be noted that only three figures come with Hit Monkey parts and they are the figures with the character variants. If you are a completist, you will be building two Hit Monkeys by the time the Hit Monkey Series reaches completion. I think one of my fondest memories of Archangel was Jim Lee's pencils in the X-tinction Agenda story arc. 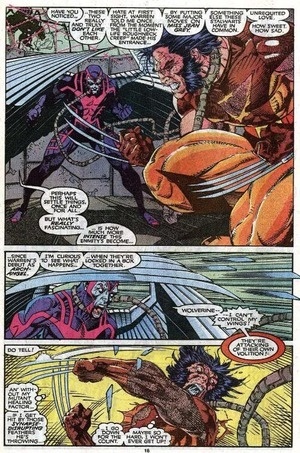 Jim Lee sure knew how to draw the X-Men characters... It's hard not to enjoy his work. The packaging is pretty normal for the RoML (Return of Marvel Legends), Some great art and a blister with our favorite tortured character from the original X-Men. You may argue that Cyclops or Beast is more interesting, or even Jean Grey. And honestly, all but Bobby Drake have really had a hell of a time over the years, but only Warren Worthington III suffered at the hands of Apocalypse and became his horsemen of Death! Incidently, I would love an alternate head with the Death Mask! And... and... an alternate set of wings with them "housed!" Archangel's blister has little room to cram anything else into it! The figure itself is noting new. The head is... well isn't new either. It was used on the SDCC Archangel... sorry to point out the obvious. What makes Archangel is the paint job. The metallic pink paint used on his detail is fantastic. The proper blues and yellow were chosen. I really can't imagine the paint and colors being any better. It is a great execution of 6 inch plastic! The only thing that would have improved this figure is metallic wings, but it is a very forgivable thing. He still makes my top Marvel Legends list. Seriously, how good do these metallic wings look? Shiny, reflective surfaces on those wings. So lovely! Funny how both Mattel and Hasbro start their comic based lines with a winged character. Both are great! But, Warren pushes past Carter, by a feather or two. Love them both, but Archangel is AWESOME!